Phakic intraocular lenses, also known as implantable contact lenses (ICLs), are implantable contact lenses that are surgically inserted into the eye where they provide excellent quality of vision with predictable and stable results. The latest phakic intraocular lens’s treat a wide range of myopic (nearsightedness), hyperopia(farsightedness) and astigmatism. How do I know if I am a candidate for the Implantable Contact Lens? A good candidate for an ICL is between 21 and 45 years of age and is myopic (nearsighted). It is preferable that the patient has not undergone any ophthalmic surgery and does not have a history of eye disease such as iritis, glaucoma, or diabetic retinopathy. Women who are pregnant or breast feeding should wait to have an ICL implanted. Those without a large enough anterior chamber depth or endothelial cell density may not be good candidates. Where is the ICL placed? 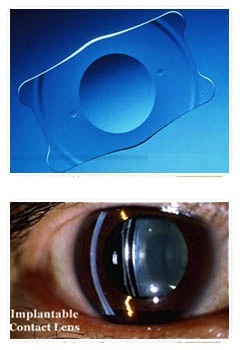 The ICL is surgically inserted through a small micro-incision just behind the iris in front of the eye’s natural lens. The ICL does not touch any internal eye structures and stays in place without maintenance. What if my vision changes after I receive the ICL? If your vision changes dramatically after receiving the implant, your ophthalmologist can remove and replace it. If necessary, another procedure can be performed at any time. The implant does not treat presbyopia (difficulty with reading in people 40 years of age and older), so some patients may need reading glasses. What happens during the surgical procedure? During an office visit one week before surgery, your eye doctor or ophthalmologist will use a laser to create a small opening between the lens and the front chamber of your eye. This allows fluid to pass between the two areas, thereby avoiding the buildup of intraocular pressure following the surgery. Most patients experience very little discomfort during the ICL implantation. You will undergo treatment while under a general or local anesthetic, perhaps with the addition of a mild sedative. Following surgery, you may use prescription eye drops or oral medication. The day after surgery, you will return to your surgeon for a follow-up visit. You also will have follow-up visits one month and six months following the procedure. Although the ICL requires no special maintenance, you are encouraged to visit your eye doctor annually for check-ups following the procedure. Can the ICL be removed from my eye? Although the ICL is intended to remain in place permanently, a certified ophthalmologist can remove the implant if necessary. Is the lens visible to others? No. The ICL is positioned behind the iris (the colored part of the eye), where it is invisible to both you and observers. Only your ophthalmologist will be able to tell that vision correction has taken place. 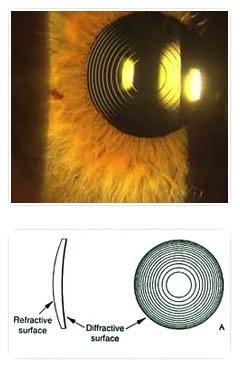 Traditional monofocal lenses, including lens implants, focus light to only one point in space. A multifocal lens has more than one point of focus. A bifocal, which is a type of multifocal, has two points of focus, one at distance and the other at near. A multifocal lens implant focuses light from distance and near simultaneously. This feature addresses both distant and near vision and makes the recipient less dependent on glasses or contact lenses. Is a multifocal lens similar to the natural lens of the eye? No. The natural lens of a young person changes shape to produce a change in focus. As a person ages, the natural lens becomes more rigid and functions more like a monofocal lens. Lens implants do not change shape. A multifocal lens compensates for the eyes inability to change shape by allowing the eye to see at distance and near simultaneously through the same optic. What are the advantages and disadvantages of multifocal IOL? Are there any alternatives to multifocal lenses? The primary alternative to multifocal lens implantation is monofocal lens implantation. If you request a monofocal lens, you will have to decide whether you want distance vision lens implants in both eyes or whether you want a distance vision implant in one eye and a near vision implant in the other eye. This latter arrangement, called monovision, provides adequate distance and near vision and is best suited for patients who have tried monovision in contact lenses previously and like the effect. Another alternative to a multifocal lens is the accommodative lens implant. Are there any risks or side effects to multifocal lens implant surgery? Implantation of a multifocal lens is associated with all the risks and side effects of cataract surgery. If you opt to receive a monofocal lens implanted in both eyes for distance vision, you will definitely need reading glasses after surgery. If you receive a multifocal lens there is an 80% chance you wont need glasses. The odds of becoming free of spectacles are better if your corneal astigmatism is low and your eyes are healthy. What if I don’ t see 20/20 without glasses after surgery? We will prescribe glasses to optimize your vision. You may also elect to wear contact lenses. If you want to improve your unaided vision further, we will offer you refractive surgery (e.g. LASIK eye surgery). Only if there is a significant error in lens power calculation will we consider a lens implant exchange. Occasionally some patients with high refractive error who are not candidates for traditional laser surgery can have a clear lens extraction. Essentially this is the same as a cataract operation with, however the patient has not yet formed a cataract. Book an appointment. Make an enquiry. © 2014 - 2019 Somerset Eye, Ophthalmologists. Website designed by Personalised Promotions in association with SA Medical Specialists. Sitemap.